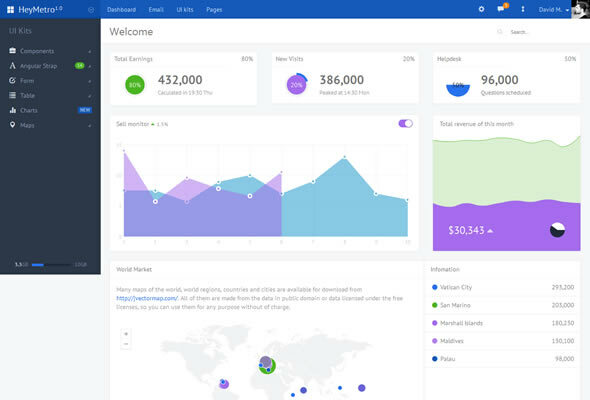 Bootstrap admin themes with fully responsive premium and free templates have more commonly used for building web applications. Twitter Bootstrap is becoming more and more popular HTML, CSS and JS framework and designers are using it as a base to start for developing responsive, mobile first projects on the web. 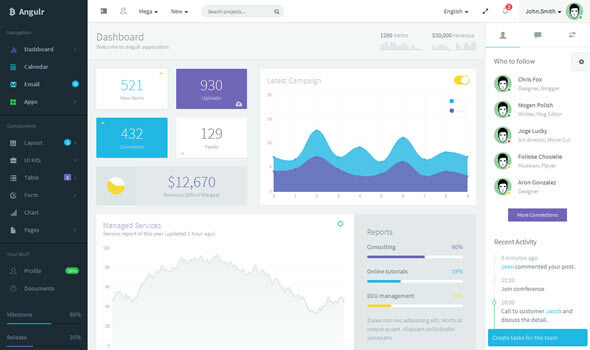 Using a Bootstrap themes for web dashboard panel allows you to get a professional design at a fraction of the price a custom design would cost. Save your precious time and money to browse our selection as they are professional and modern admin themes for Bootstrap apps to quickly create an elegant and fresh look for any back-end applications. Check out the live preview, and donâ€™t forget to visit all dashboard themes, detail pages and try all options in settings. 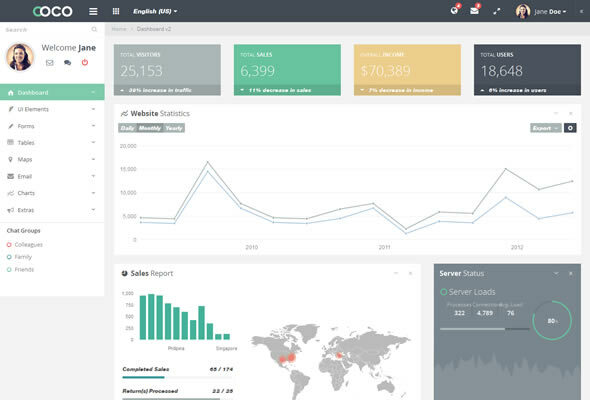 AdminLTE is an easily downloaded freely available Bootstrap admin theme responsive and valid HTML5 and CSS3 template code. 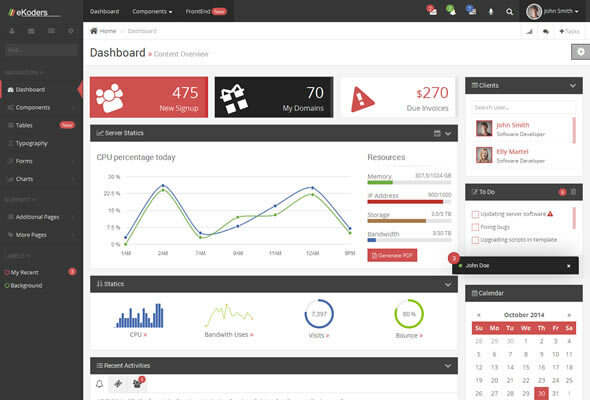 Great for web application and anyone looking for a modern and clean look dashboard theme. 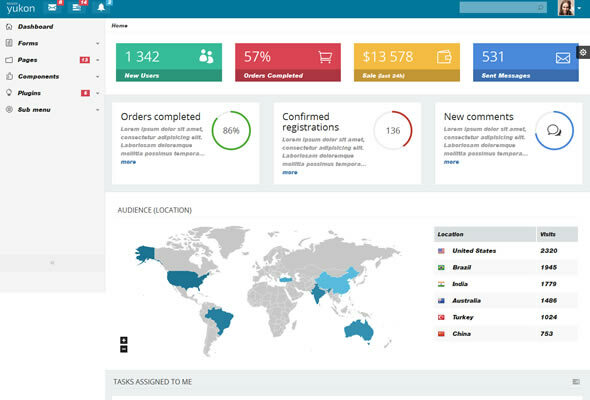 TemplateVamp is a fully functional and customizable admin template that leverages the power and flexibility of HTML5 & CSS3. 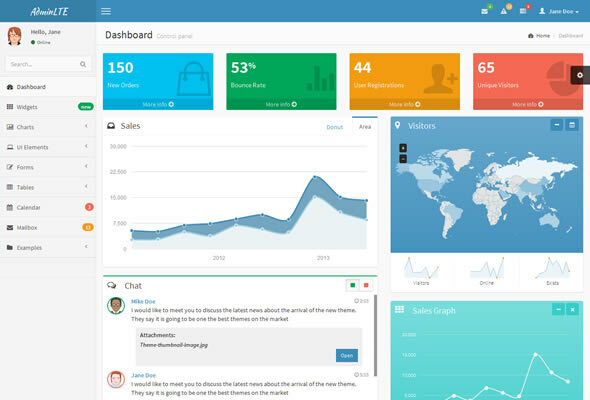 This free admin template based On Twitter Bootstrap 3 is not as visually striking but fairly straightforward for web dashboard panel. 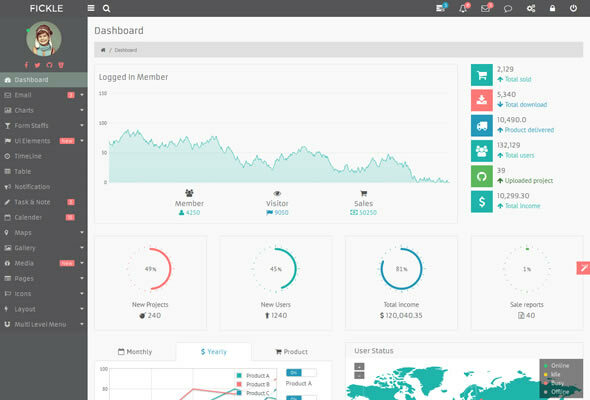 DevOOPS a free admin theme, design with a modern and clean dashboard layout, download bootstrap theme looks great with customizable multiple Charts and multilevel menu and widget elements. 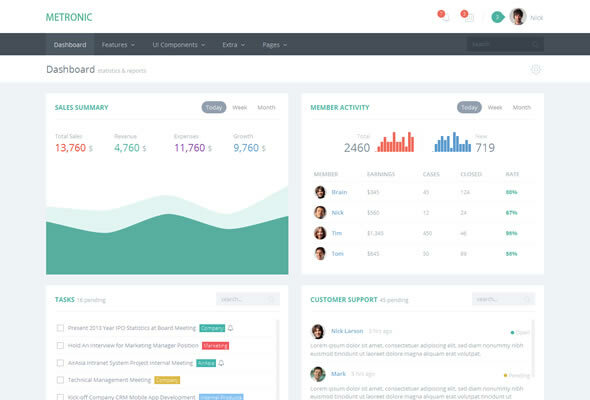 This is a ready to use theme and front-end template for CRM, CMS, SAAS, or any web application to focused on User Experience with clean and intuitive design! 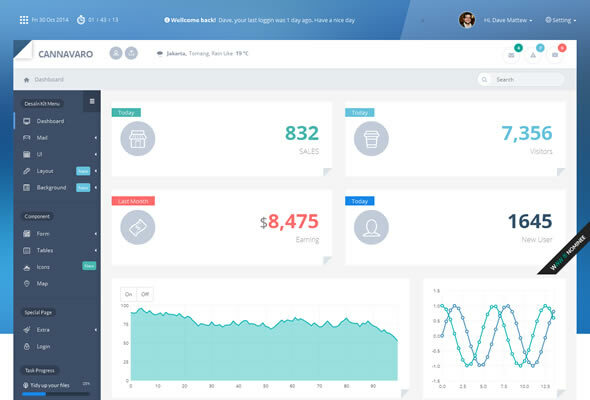 Avalon is not just one theme â€“ it is a framework, packed with front-end theme and a landing page that exploits the powerful dashboard’s and itâ€™s consistent styling. This responsive template built with Bootstrap 3, HTML5 CSS3 and LESS with Frontend theme. Work best with all devices with most possible compatibility. 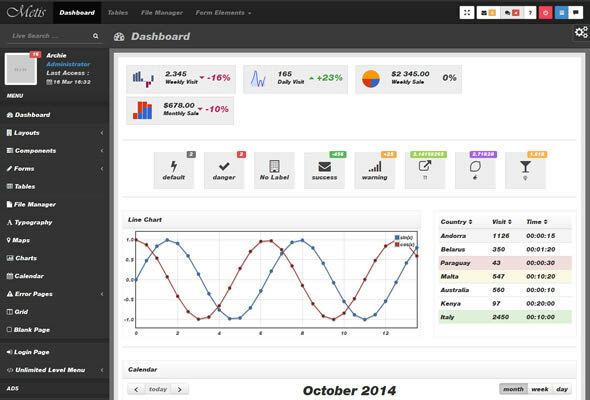 Including coming Soon features chat application, new dashboard variations. more color schemes, Php and MySQL user login. Karma is built especially for minimalist lovers, the biggest feature of this theme are the modulized sidebars, this theme build for any web-app UI. 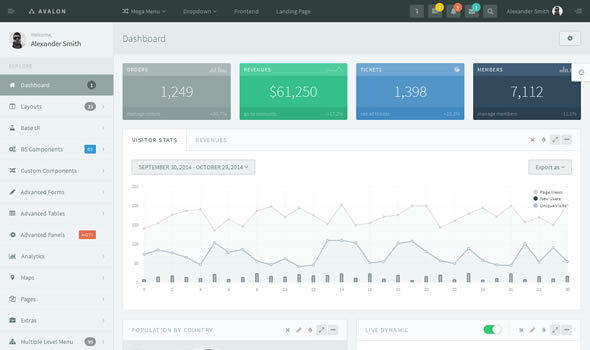 This is an AngularJS and Bootstrap, responsive web application theme. This template is responsive retina ready work best with all mobile devices. Atlant theme comes with beautiful front-end theme and Slider Revolution for best UI design for developers designers friendly clean commented codes. Make a different dashboard design with this Cannavaro notepad memo concepts to looks completely new in dashboard panel by provide optimal viewing experience across of all of devices. All the features can support with Bootstrapping. 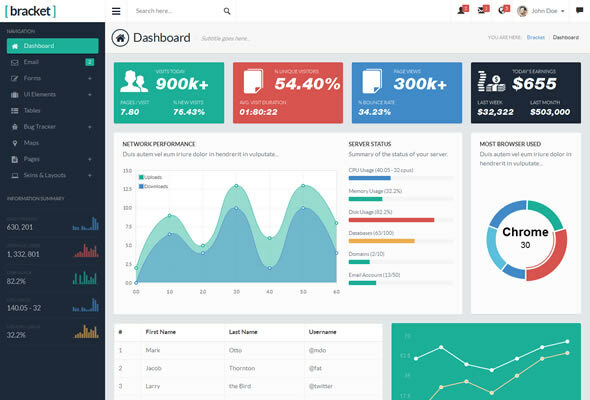 Bratilius Bootstrap responsive admin UI kit bundled with over hundreds of components includes, widgets, jQuery charts, HTML other elements and Modular resources are nicely structured to use in you project with the AgileUI framework to choose by multiple layouts. This responsive html template inspired by flat design theme to build professional designed dashboard panel for web apps with nice animation and smooth interaction in navigation for better user experience. 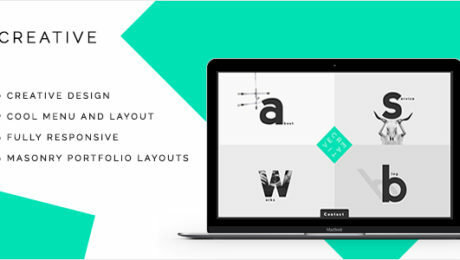 Ideal for building web application designs with ready to use components. 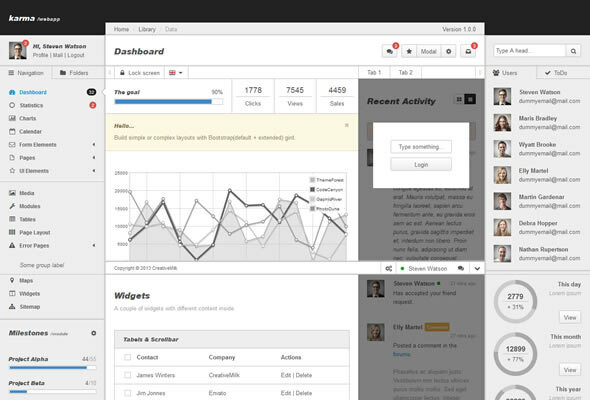 Along with 2 admin themes and 3 front-end themes powered with Twitter Bootstrap 3.2.0 Framework. Metronic has a sleek, clean and intuitive metro & flat balanced design can be used for web applications, eCommerce backends, CMS, CRM, SAAS and portfolio, blog and business websites to look awesome and yet user friendly with lots of plugins and UI components. The theme author release continuous long term updates and dozens of new features in future to allow you to use your same license to free download of all future updates. If you are web application developer and want to use Bootstrap template for your web apps project, then this AppUI professionally designed premium and flexible web app template is best for your creative project. 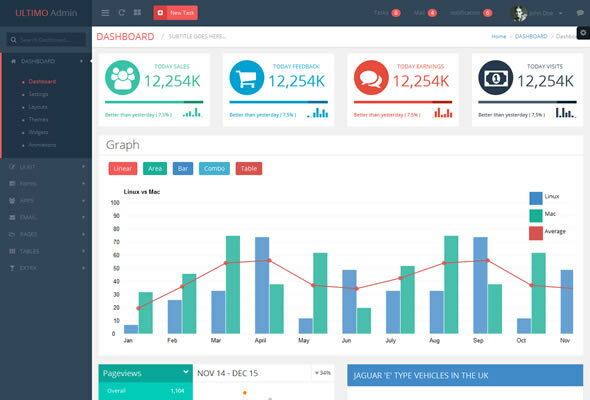 This powerful bundled with tons of accurately styled and predefined components, plugins and features that can be used for dashboards, CRM and CMS panels. 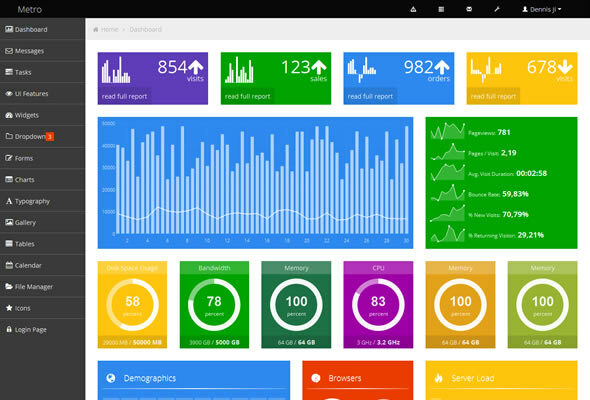 ORB is responsive template with unique features, such as Widgets, Portlets Gallery, Awesome Inbox App, Multiple JS charts and graphs, Form Validation and AJAX Processing, animated Modal and Popover classes and much more. This clean, HTML5 CSS3 based on Twitter Bootstrap AngularJS framework web app, it is support customizable LESS, to all modern browsers compatible and works best from devices to desktop for any type of web application theme. 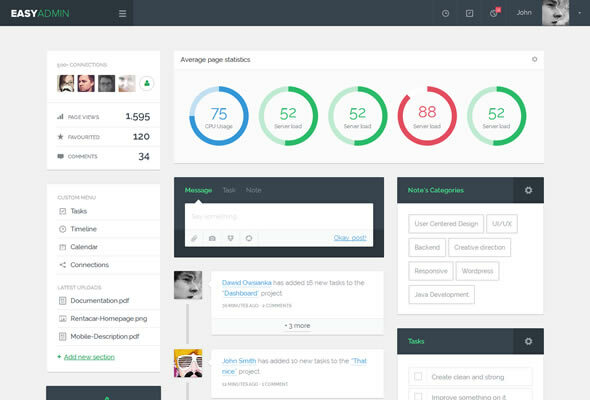 Fickle featuring a LTR and RTL, this is responsive admin theme based on Bootstrap for simple and clean design web apps panel. 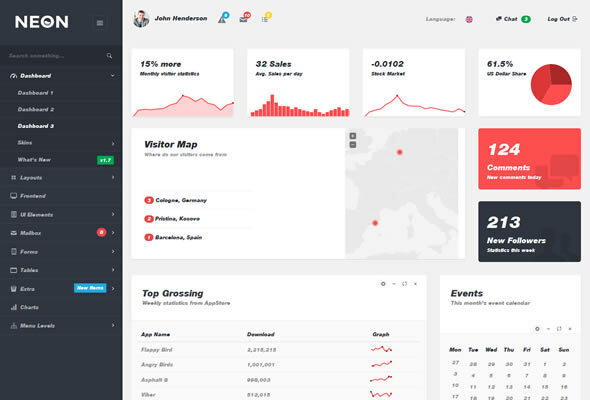 Ultimo is a clean, crisp Bootstrap admin dashboard template with useful components to use any plugins and widgets. 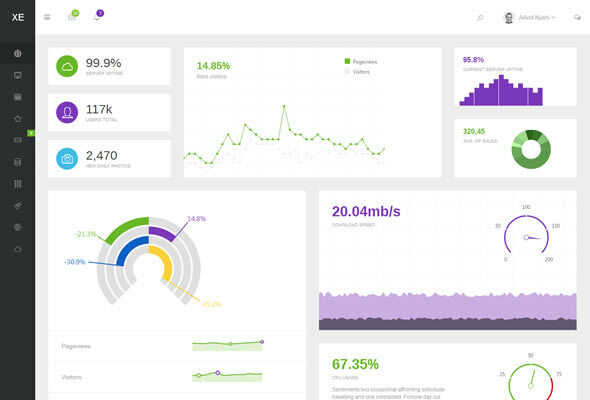 Make your application dashboard rich and robust with this Bootstrap admin theme. Bucket is a flat design concept with easy customization Chart, color and styles as per your back-end apps needs. 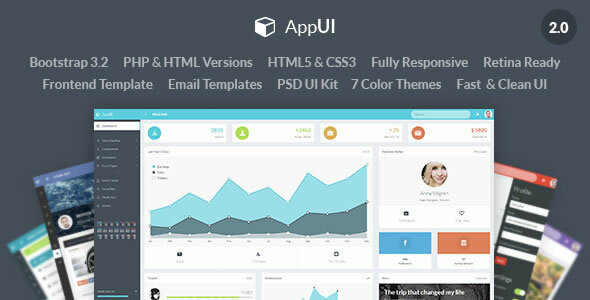 It has a big collection of reusable UI components and integrated with useful jQuery plugins. 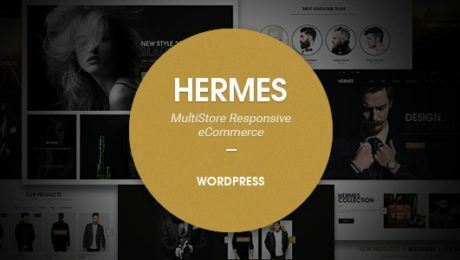 This plain and simple, awesome theme for multipurpose usage with any web application, It is more than hundreds of HTML files for variety of layout options and resources. 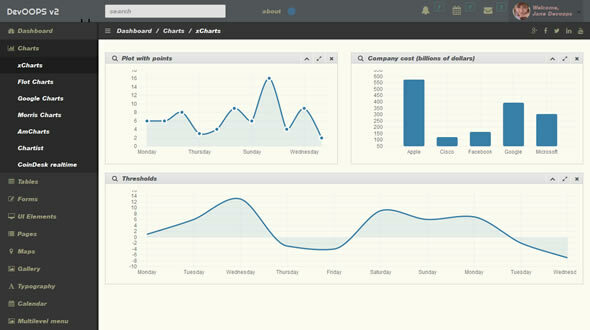 Bracket is easy to use flat design responsive Bootstrap themes for modern dashboard design projects. 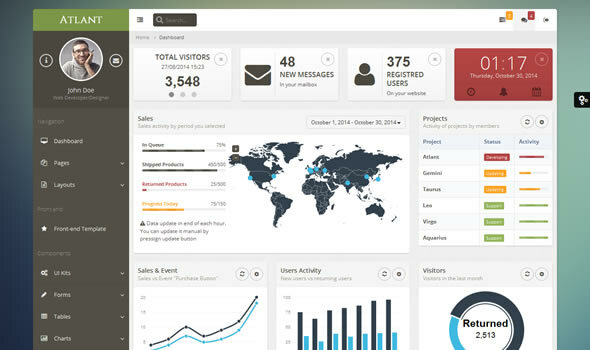 This Bootstrap 3 admin template works best on all handheld tablets and phones. Built on LESS, built with twitter bootstrap 3.0, all packed in one as complete set of modern standards and top notch design to make a wonderful theme with each and every useful feature for all types of web applications. 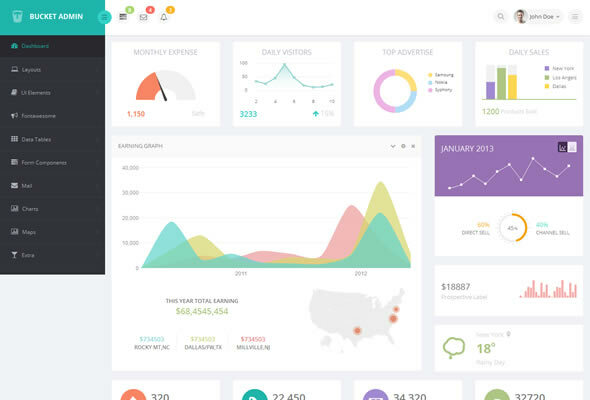 Cascade is a light weight, Flat, responsive, admin dashboard template with bunch of premium extended features, strong code structure and useful jquery plugins. Each module is highly optimized for different browsers and devices. 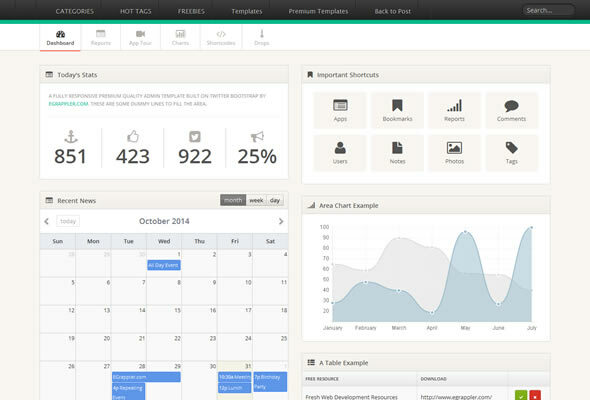 A Bootstrap 3 and AngularJS based Bootstrap site templates for admin web application. 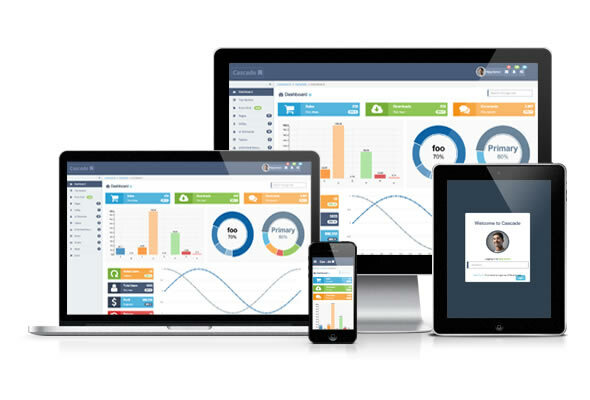 This beautiful and modern designed themes with powerful and accessible UI for interactive web applications. 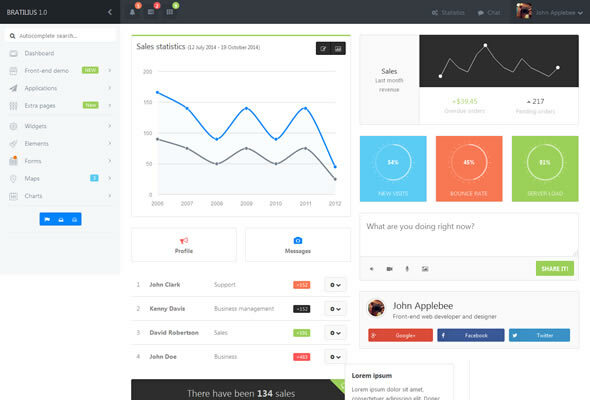 Supina is curated with bunch of widgets and plugins. 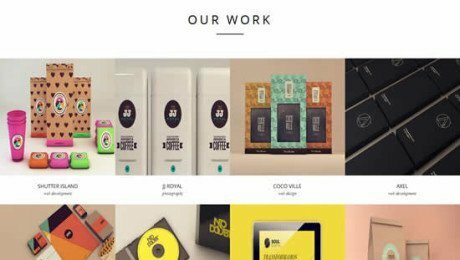 The ultimate UI kit packed with hundreds of HTML pages, elements, components, color schemes and multiple layouts templates.